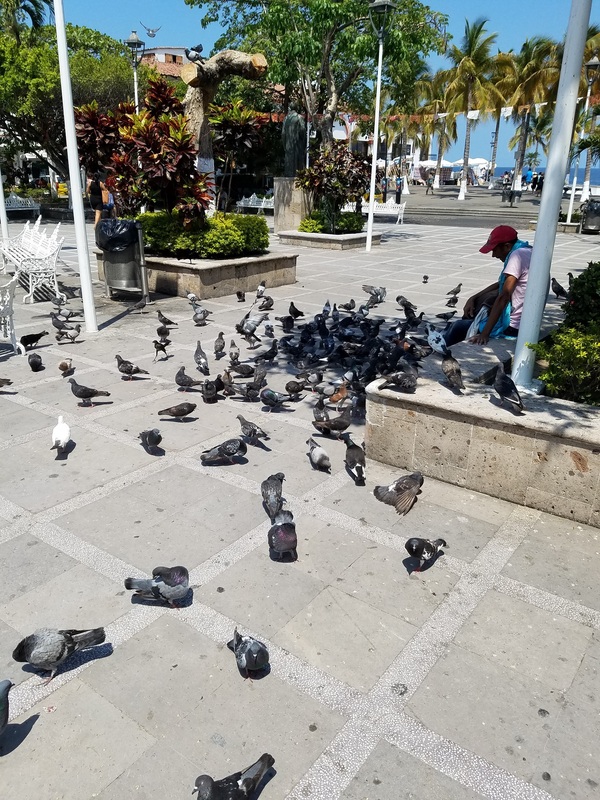 I recently spent a couple of weeks in Puerto Vallarta, a resort town in the Mexican state of Jalisco – one of half a dozen visits in 25 years. In that time, a lot has changed, in the town and in the visitor. I intended the trip as therapy, to recuperate from some surgeries on hip and heart, and re-energize an aging body. I thought nothing beats bright sun, good long walks along the Malecon (walkway) by Banderas Bay, and a healthy diet. Possibly the images in my memory were a bit edited, like this photo (thanks to Google Photos). Maybe I associated it unconsciously with childhood summers in Longport, N.J., where my father’s father – a Philadelphia lawyer – had bought a cottage by the sea, close to Atlantic City. My family used to spend vacations there, swimming, building sand castles, burying each other, fishing in the surf or from the jetty or pier, hunting for seashells, and chasing sand crabs. There was a good meal waiting when we came home. The light tan sandy beach was wide, and quiet, and mostly empty, except for a few people from neighboring cottages. Our place was at the south tip of a long off-shore island, separated from the mainland by a marshy bay, at the end of the trolley line. The periodic squeak squeaking of the trolley making its u-turn was somehow reassuringly familiar, especially at night as I fell asleep. Puerto Vallarta is advertised as a balneario. In European Spanish that word means a spa – i.e. baths, medicinal waters, hot springs, health resort, etc. But in Latin America it means a seaside resort. I didn’t know that. It’s easy to mix up the two, which is what this town does, and I did too. There’s no lack of water, and plenty of doctors, clinics, pharmacies, hospitals, massage parlors, health and fitness centers, but this spa is primarily a resort, oriented to make people feel good and sell stuff. No doubt the water and sunshine can be comforting and healing, as they can be scary and dangerous. Where I stayed, the surf is strong, the beach is pebbly and steep, and the water gets polluted often. Still, my ideal for a place to retire must be close to water. It must be close to a big city too, which doesn’t apply to Puerto Vallarta, but to its much larger neighbor Guadalajara. In Europe and many other societies around the world, spas have long played a part, and still do, even though modern medicine might question their curative powers. Spas were especially important in the life of ancient Greeks and Romans. The word ‘spa’ could be an acronym (S.P.A.) for the Latin phrase Sanitas Per Aquae (“Health By Waters”). Roman and Greek soldiers took R&R (rest and recreation) beside, in and from the ‘waters’. There are water spirits in the legends. Even the spirit of water was sacred, in many places. But regardless of mythical forces, the warmth, the minerals, the care provided by attendants, and the water itself were and are known to be curative. The modern idea of a spa has changed all that (especially under the increasing influence of marketing) into a place where middle class people with some disposable income are encouraged to spend as much of it as possible, on as many enjoyable activities, exciting adventures and sensual delights – called “experiences” in the ads – as can be had in the time allotted. The really well-to-do go other places for ‘recreation’, like the Seychelles. 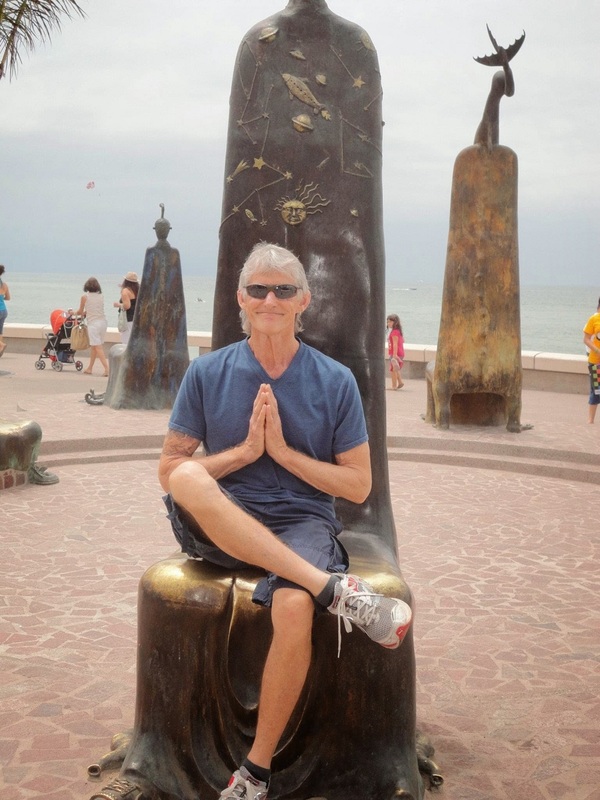 Puerto Vallarta is not the best choice for anyone still hoping to work on a “sound mind in a sound body” as Plato recommended long ago. I also found that at this season of the year (mid-May) the weather there is oppressively sticky: hot and humid. Heavy outdoor activity, even for young athletic types or northern sun seekers, is not comfortable. Open exposure to sun raises skin cancer risk. Not good. It’s interesting that the picture perfect dark skin tones many fair skinned young Americans work to get and keep used to be a symbol of under class people who had to sweat and toil in the sun. In my parents’ childhood, people at the beach covered themselves from head to foot in dark clothing, as the picture here shows, to be properly modest, and retain white skin. As we all know, skin color is still a major social issue, in America and around the world. The ‘good long walks’ I planned to take require ‘good long legs’, with joints that work more smoothly than mine do right now, after years of running, arthritis and a hip replacement. It takes guidance, physical therapy and patience needed for repair, which my time in Vallarta wouldn’t provide. 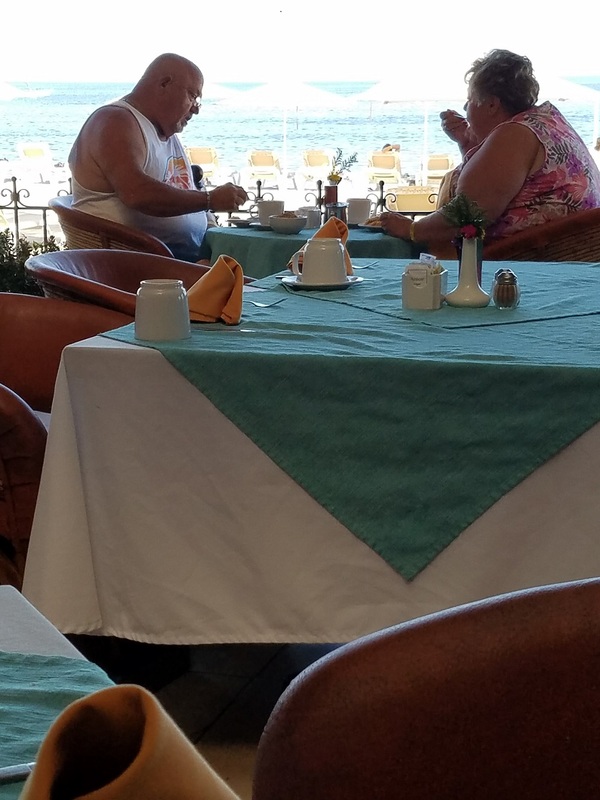 Most frustrating, the needed ‘healthy diet’ is almost unheard of anywhere in this popular resort destination – least of all at my beach-side hotel. I should have known it from previous visits, but in those instances, I had no motivation to notice the obvious. Eating well (as opposed to ‘pigging out’) appears to interest only a few ex-pats from Europe and El Norte (The North – read the US), or members of the growing gay community who live in the Romantic Zone and farther south along the bay. All this uncomfortable reality about a healthful vacation set in soon after my arrival; so clearly an attitude adjustment was in order. I needed a place away from the hotel to observe, think and write. 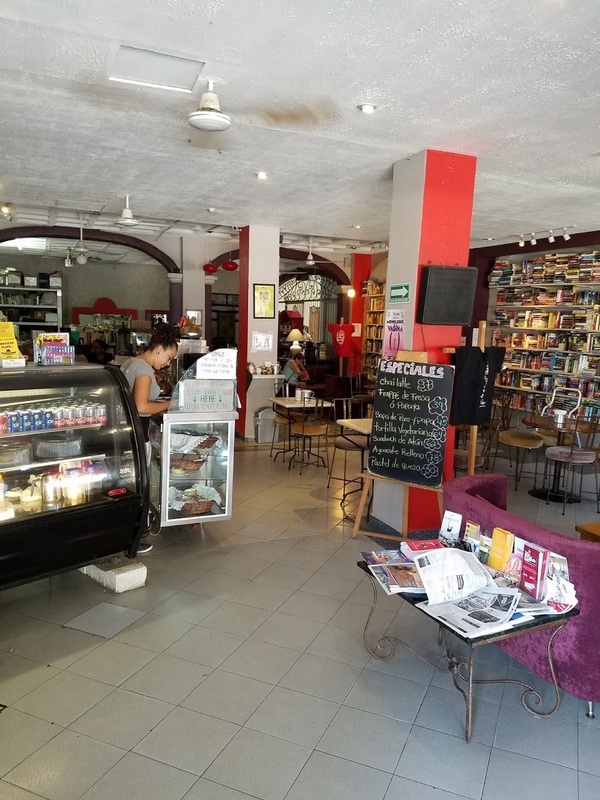 Luckily, a few blocks away, I found a local ex-pat hangout called Una Pagina en el Sol (“A Page in the Sun”), that combines a coffee shop, multi-lingual used-book store and reading space. To my pleasant surprise, it was the same cafe I had visited before, but moved to a new location. Changing focus, I sat down with a coffee and laptop, to ‘philosophize’. How should I pass the time, get healthy, and learn something? Teaching people about philosophy and the humanities for almost 50 years, I should know a lot about putting things into true perspective. After all, isn’t philosophy mostly an effort to see the ‘big picture’ in everything, and look objectively at life? Yes, but it’s much easier to do this when when you’re analyzing other people (and their lives, worlds and beliefs) than when you’re looking at yourself. It may sound quaint today, but I still believe serving the truth is the proper goal for a philosopher. However, that requires self-knowledge – especially knowing our own shortcomings – together with discipline and self-correction. “Know thyself” and “Heal thyself” are ancient sage advice. The new “Page in the Sun” cafe is not quite so sunny as the original. The old location included an open-air sidewalk patio, under a translucent white awning, admitting lots of light, but not too much heat. (Isn’t that symbolic of what’s needed in the US?) Here’s the old site, as it was 5 years ago; then coming down to make room for growth, during the week of my arrival (with awning frame still up); and last in process of reconstruction into something more income-producing, as I left for home. I’ll turn to new construction below. On the first Sunday morning after arriving, I went to the new “Page”, and sat down at ‘my’ small table, behind a post, to write and watch people. 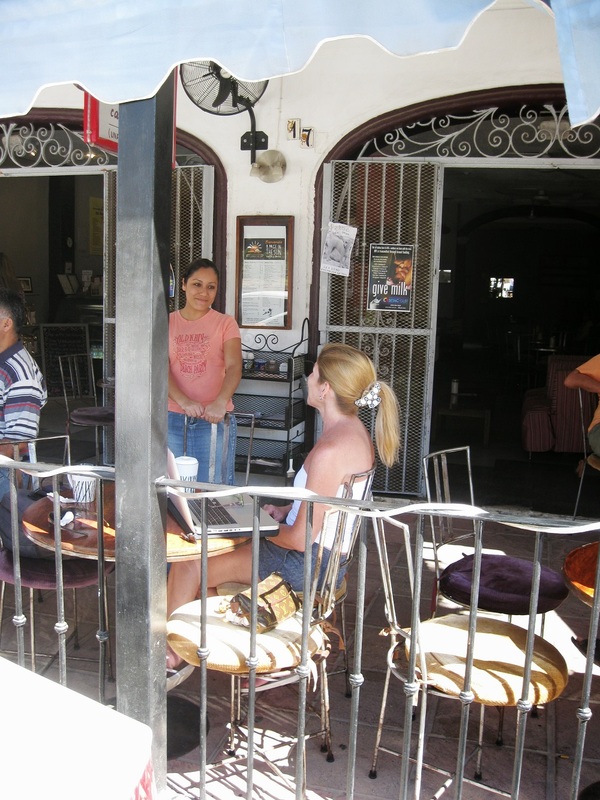 This is the wealthiest, most multi-cultural, gay-friendly, liberal tourist sector of Puerto Vallarta. It markets itself as “The Romantic Zone”, and appeals to all varieties of romance, and gender identification. 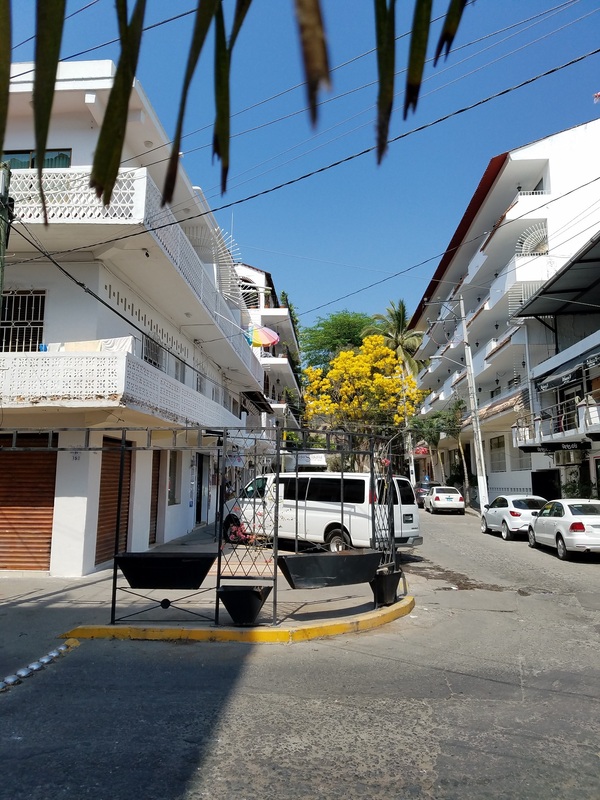 Lying just south of the little stream (Rio Cuale) that separates it from from Centro (downtown), this barrio (neighborhood) prides itself for being totally welcoming. You can see this sales campaign in the ever-present publicidad (advertisements), put out by private, municipal and State agencies and businesses. 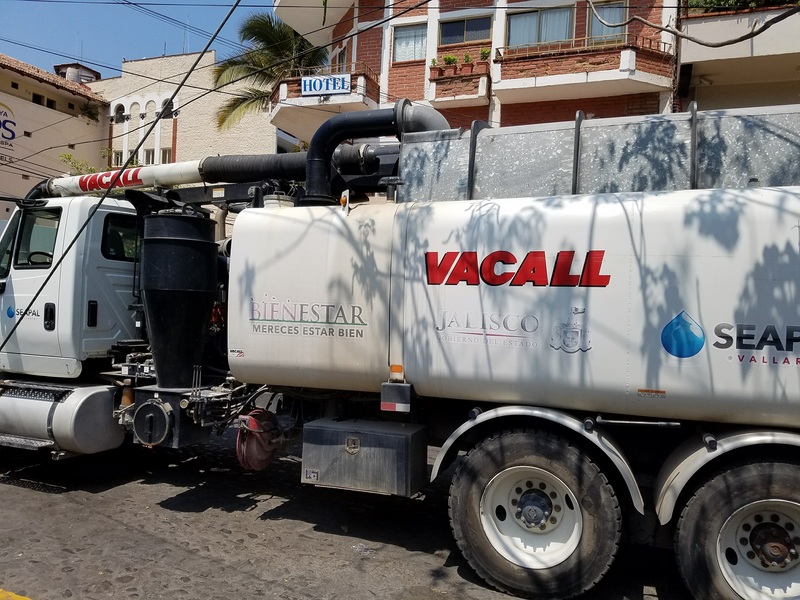 This attitude is underscored by logos and slogans on T-shirts, caps, uniforms, store signs, street markings – even on the sewer-cleaning truck that advertises Bienestar (wellbeing), and Mereces estar bien (you deserve to be healthy)! In short, any entity whose livelihood depends on tourism joins in to make Puerto Vallarta appealing. Here is one of the catchy logos in the neighborhood where I stayed. 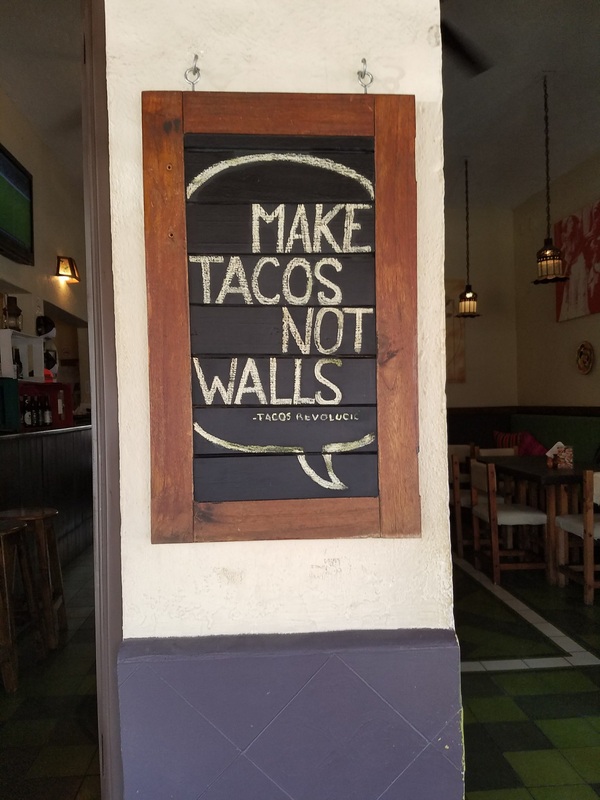 It’s rather obvious that there are reactions here to the threatening tweets put out by the latest US president referring to Mexican immigrants and their danger to America. Centro is noted for its “Cathedral” (actually a small church), fronted by a plaza and park, together with the Malecon – a long sea-side walkway, that runs north from the plaza. 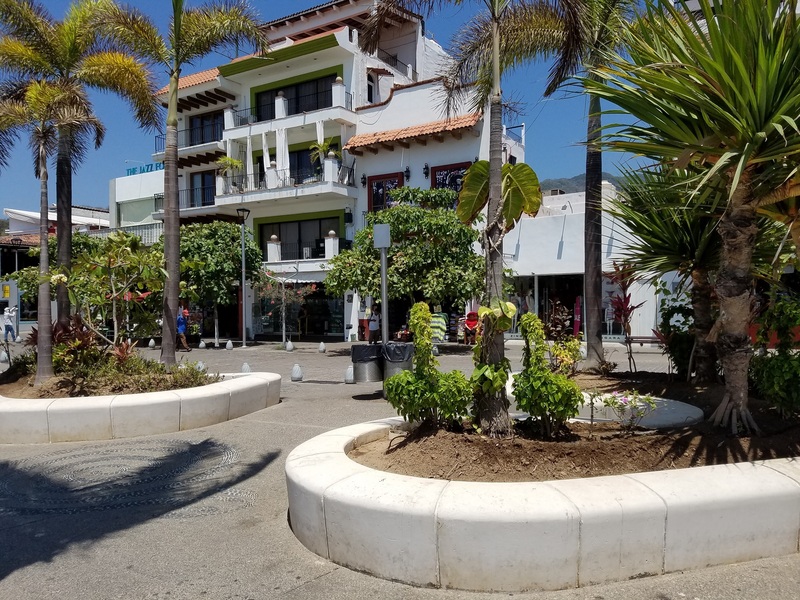 Public sculptures, palm trees, acrobats, street entertainers, and vendors, make this ocean side strip a charming tourist attraction. Many forms of English are heard (from the Brits, Aussies, Canadians, Irish, Americans, and of course shop keepers, most of whom came from elsewhere, in Mexico or abroad, for higher wages, or business opportunities. 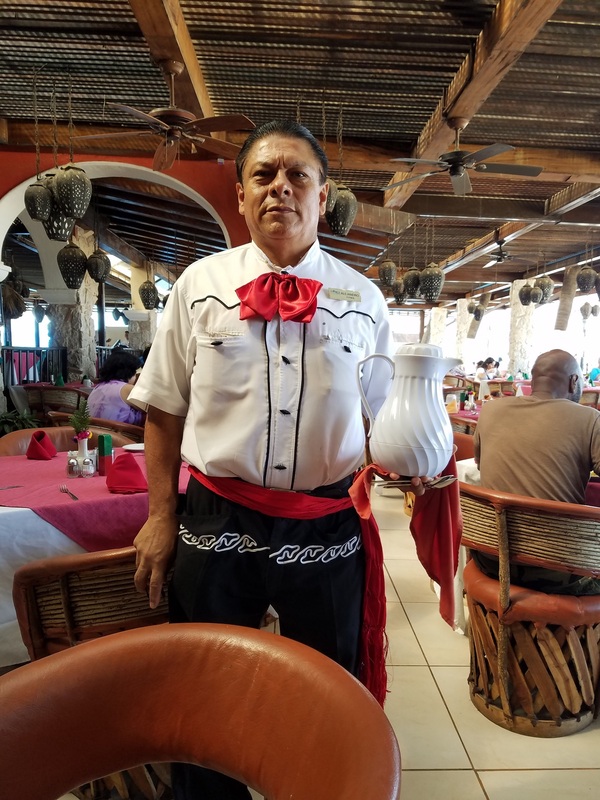 It all makes for a very cheerful, stranger-welcoming atmosphere, and has been that way for a some time, since Vallarta blossomed into a popular spa destination. While I was mulling over these facts, and how to interpret them, looking for good photos on the computer to illustrate points, and thinking how to make a blog post of it all, a mother and child walked in, and began to settle down by a coffee table towards the front. From their speech, I inferred they are from the US. The mother (Dakota) says to the daughter (Ashley), “Stay right here. It’s dangerous!” And she goes to the counter 10 feet away to order something. Immediately Ashley walks off to inspect the book offerings, categorized by languages, on tables towards the back of the shop. A minute later, Dakota returns and doesn’t see her daughter. Immediately she’s beside herself. “Ashley! Ashley! Oh my god, Ashley! Where is she?” Then she notices her daughter, and exclaims “I thought someone took you! Oh, What a horrible feeling!” etc., etc. Just then, the father enters (no name mentioned), and the nuclear family is reunited at last. What an act! I try to guess where this family comes from. Maybe … Kansas? Put it in the post! As I said earlier, “A Page in the Sun” was relocated, to make way for a more lucrative use of the the building. As is the normal case, the shop keeper here has a lease from the property owner. 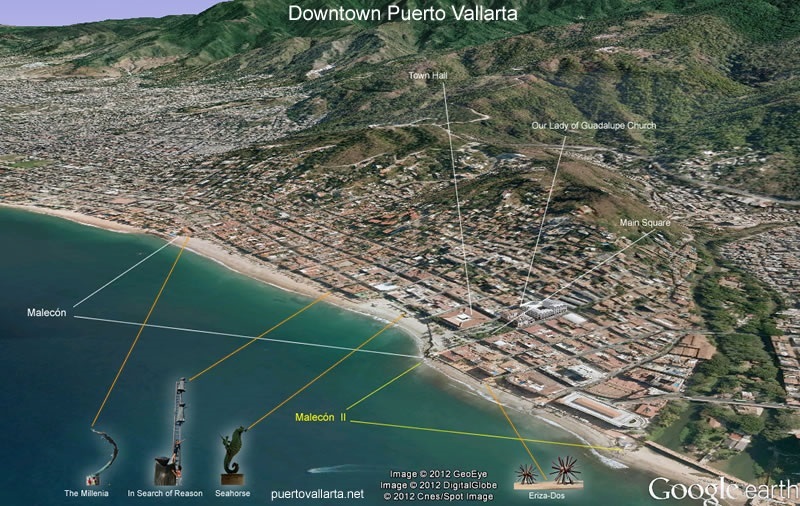 In fact, a construction boom is underway in Vallarta. It’s eye catching. This is especially true in the areas where temporary vacationers, or seasonal residents are concentrated, together with management level hotel employees, and the owners of businesses who serve them (groceries, pharmacies, restaurants, clothing stores, health facilities, etc). But poverty and decay are also evident, both open and somewhat out of sight. 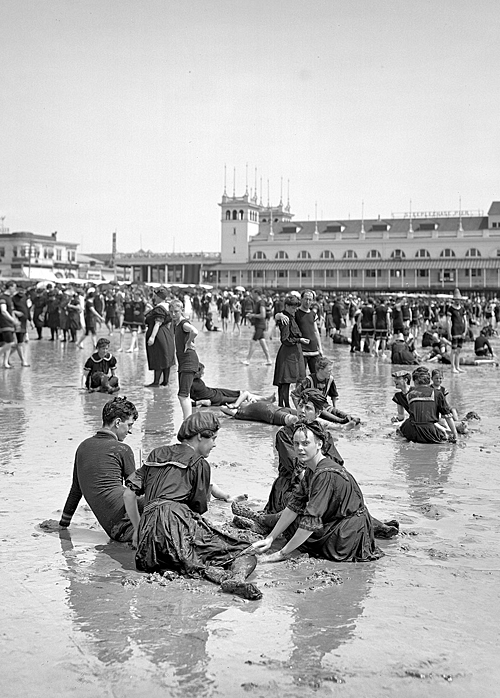 Up and down the beaches, men and women – usually dressed in white for comfort and in lieu of an identifying uniform – carry heavy bundles, or baskets or trays of mass produced objects: bright colored blankets and throws, ponchos, silver and torquoise jewelry, trinkets like woven bead bracelets bearing names. If she doesn’t have your name on her display, she’ll find it from a friend, or even make it on the moment. Others offer to braid and decorate hair, or give henna tattoos. And there’s an endless parade of freshly roasted meat on skewers, and sweets. I think these goods and goodies are mostly sold on commission only. Most vendors don’t get an hourly wage. This beach merchandise is found away from the ocean as well, in roll away street stalls, or in larger covered permanent markets, together with apparel like hats, sandals, tops and skirts. 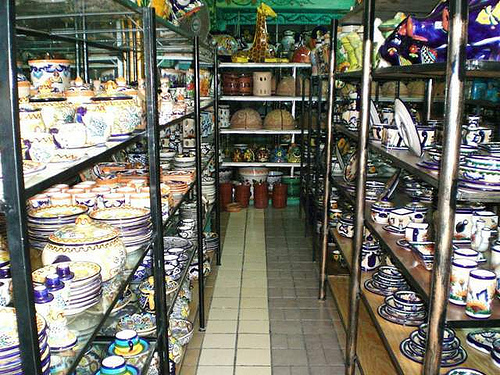 Much of it is marketed as “artisanal” – i.e. (allegedly) made by indigenous Mexicans (or Indians). None of it is produced by the people who display it, along with more costly goods, which they sell on consignment. Whole families tend these sidewalk or street ‘stores’ from dawn to dark, feeding hungry babies, chatting with siblings and grandparents, keeping an eye out for customers, and sharing whatever good or ill fortune provides. Begging is noticeable, too, especially the more troubling child begging. The wealth divide is very great in Mexico, but there are fewer people in the middle of the spectrum, than in the US. Another difference is that homeless people contradict the family orientation of Mexican traditional culture. That is, a family is expected to take care of its own, so beggars are looked on with suspicion, not sympathy. They don’t ‘belong’ anywhere. 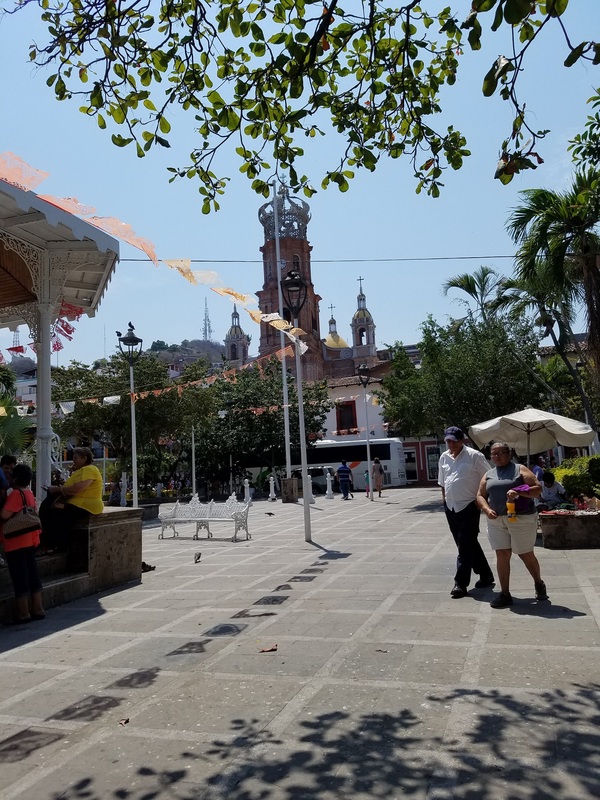 You’ll see a disabled or old indigenous woman here and there, sitting in a patch of shade, offering a pack of matches or piece of gum for a few centavos (pennies). The construction boom also demonstrates what is often called ‘creative destruction’ – i.e. getting rid of the old to make room for the new – an oxymoron coined in 1944 by Joseph Schumpeter, (1883 – 1950), an Austrian economist who came to American just before WWII began, to spend the remainder of his life teaching at Harvard. He caused much controversy by his views. He questioned that citizens are capable of enough good judgment to make democracy work, and that party politicians, like capitalistic entrepreneur, appeal only to individual self interest. The result may be that when enough people gain enough benefit from economic growth – including especially more education and awareness of how the system works – they will replace capitalism with socialism. Today that seems like a more realistic possibility than it was in the 60’s, when the cold war heated up. The catchy term ‘creative destruction’ has a positive sound. It has a parallel in Hindu thinking, where Shiva the destroyer and Vishnu the preserver govern the changeable universe. It’s quite natural to say that ‘creation’ is good, and ‘destruction’ is bad, but if destruction can be creative, it suggests that the long term benefits of change will offset the short term harm. That allows a way to ‘spin’ capitalism (or the ‘free market’). However, happy expectations, which are natural, need to be evaluated by actuality. The value of outcomes can only be judged if there are standards to judge what is actually good and what is actually bad. There is little agreement about such standards today. Certainly such values can’t be reduced to monetary outcomes, backed by mathematical analyses . Today orthodox macroeconomics describes economies numerical and financial terms (GDP, productivity, employment figures, inflation rates, etc.) and (rough) calculations are possible about who will make or lose money ‘in the long term’. But the ‘long term’ differs for different people. An up and coming property developer sees the future earnings from the apartment complex or shopping center under consideration as of more value than does the displaced aging farmer whose property it is, who has few years left to live, and knows and loves farming. It’s similar with the contrast of viewpoint between a Silicon Valley entrepreneur, and a retired factory or office worker imagining other kinds of development, such as automation, self-driving cars, data processing, or artificial intelligence. One enjoyable part of travelling, for me, is to discover, if possible, if the changes I see are showing development or decline, especially in terms of the people who are affected, the culture they live in and influence, and how these relate to other communities and places I’ve visited, lived in or studied, in the US and abroad. 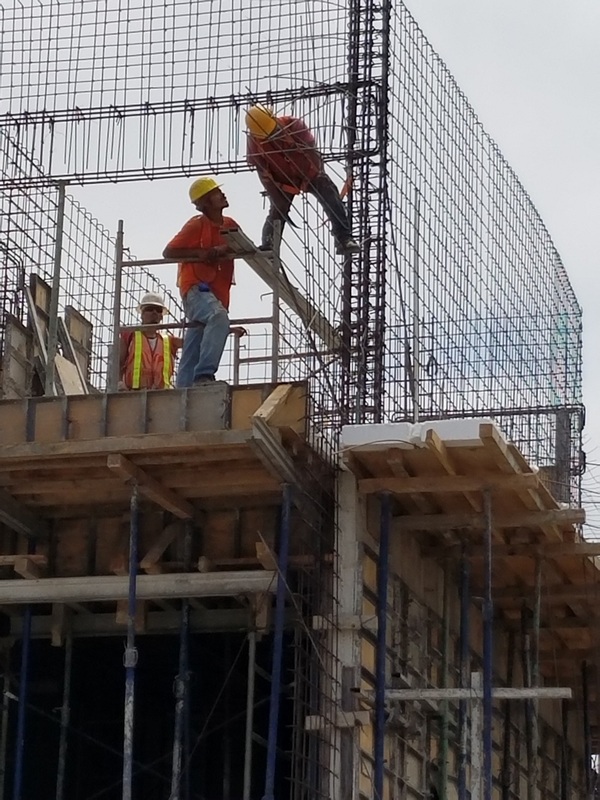 It seems that everyone likes construction. As a kid I was fascinated to watch workers and machines, wrecking and rebuilding old structures. My father was a contractor and builder. But like houses, bombs are constructions too. Figuratively, a house can be a ‘bomb’ and blow up, if economic forces are misunderstood, or abused. This was painfully obvious in the housing bubble that burst in 2007, causing the Great Recession. Most people still assume that if they can find a house, it will inevitably gain value, and give them a comfortable asset to support their desired life style now, and provide some retirement income if and when it is sold. The old view sees a house as an” investment”; that was the norm for a long time. It may not be true now. Here’s an article that shows, among other things, how and why real estate, which represents about 80% of all loan transactions today, is no longer a safe investment for ordinary people. It’s by Michael Hudson. Moreover, against the norm of today’s economic teaching, Macroeconomics is not a subset or a development of Economics. The big picture should come first. Political Economy recognized the subject’s connections to ethics, critical thinking, and the uncertainty of both. In that sense, it was more philosophy than science. So, as we watch construction and destruction taking place in communities around us, it’s well to think of what’s happening in the ‘real economy’ as these changes happen. The ‘real economy’ is one which is concerned for human values, that are always questionable, messy, and controversial. Real economics (at the level of over all social effects) can’t be made scientific by the mere fact there may be statistics and ‘big data’ involved. See this piece by Philip Pilkington. Where is Puerto Vallarta going? Where is Puerto Vallarta going? Does Puerto Vallarta illustrate Mexican trends? I think both the city and the country are following the development pattern of their northern neighbors, of western Europe, and the rest of the westernized nations, like Japan and Australia. The same forces for change are at work around the world, but often they are not understood by the people most affected. Furthermore, the historical developments in the western Europe occurred without the same awareness of the process that is possible for societies today who have the old examples to look at. So Mexico may develop differently. I think the main driver in the West, and those countries who look to the West as their exemplar, is still capitalism. However, it is financial capitalism that dominates economics around the world today, which is very different in form and influence from 19th century industrial capitalism, which in turn differs from mercantile capitalism during the Renaissance and earlier ages, in Persia, Greece and Rome. Obviously it’s hard to get any kind of big picture from a short visit, or even with the half dozen extended stays in a period of 25 years, in my case. But we can start with ‘big pictures’ literally – at least large scale photos – to place Vallarta in a geographic setting. Here are two aerial views of this bay-side city, with its major districts labeled. 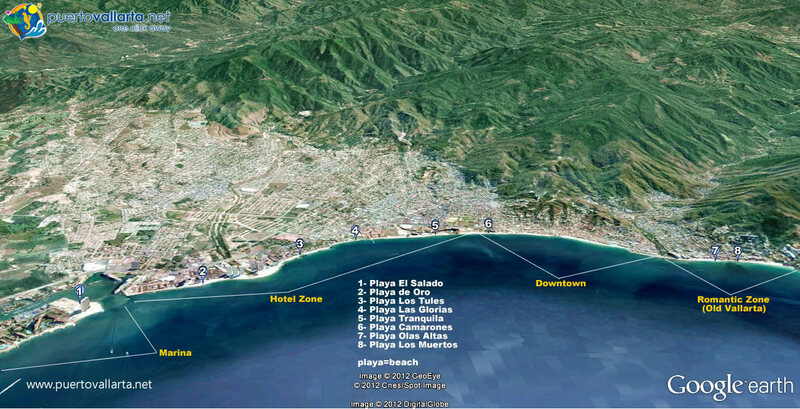 Puerto Vallarta is on the coast of Banderas Bay, which is located on Mexico’s Pacific – i.e. west – coast, about midway between the border with the US on the north and Guatemala on the south. 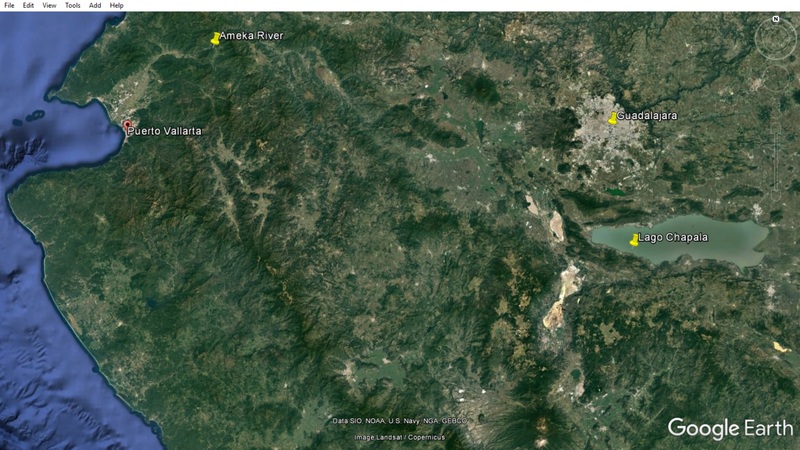 It lies in a delta floodplain at the confluence of two rivers that rise in the coastal Sierra Madre range – the larger one being the Ameca, which shows in the following map, where Vallarta is seen in relation to the much larger city Guadalajara, in the highlands to the east, just north of Lago (Lake) Chapala. Chapala is Mexico’s largest fresh water lake. 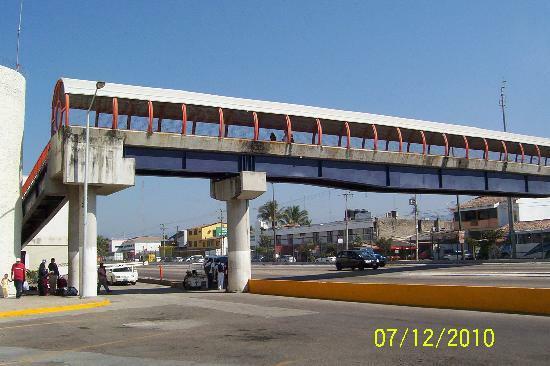 Guadalajara with population of over 4 million, has more than 16 times the number of people as Vallarta (220,000). 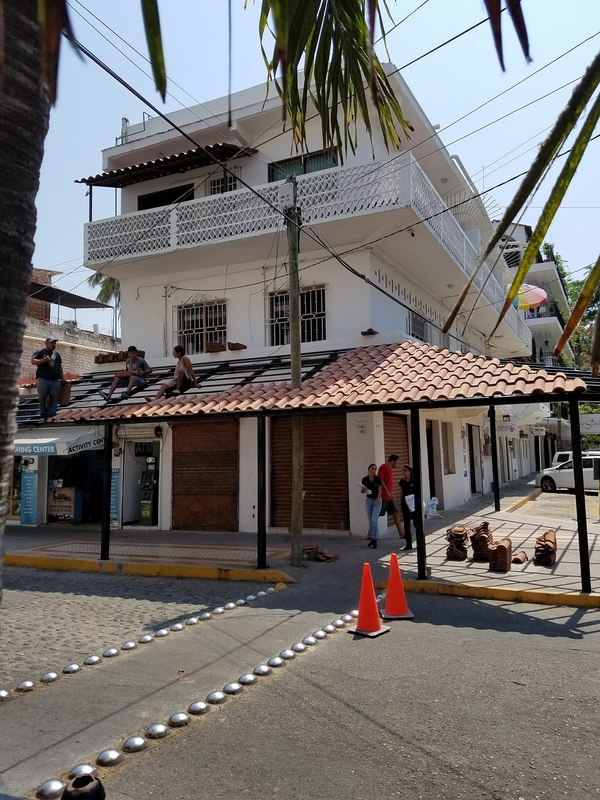 Along Lake Chapala’s north shore are half a dozen towns, including Chapala and Ajijic where as many as 30,000 expatriates live at least part of the year, including Canadians and Americans. The community is described in this article. 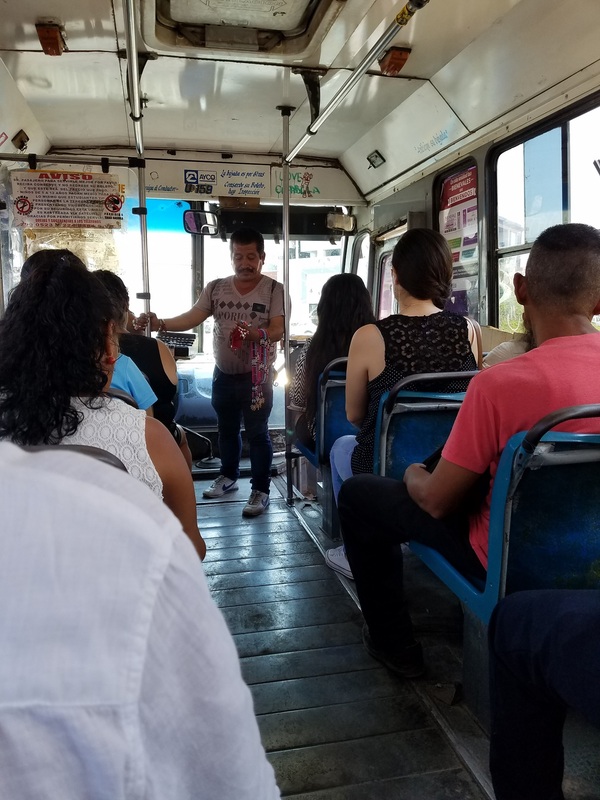 Guadalajara has business and political connections with Vallarta, and its citizens, including expats, and especially the gay population, who are attracted to Vallarta whenever they want a nearby resort vacation. 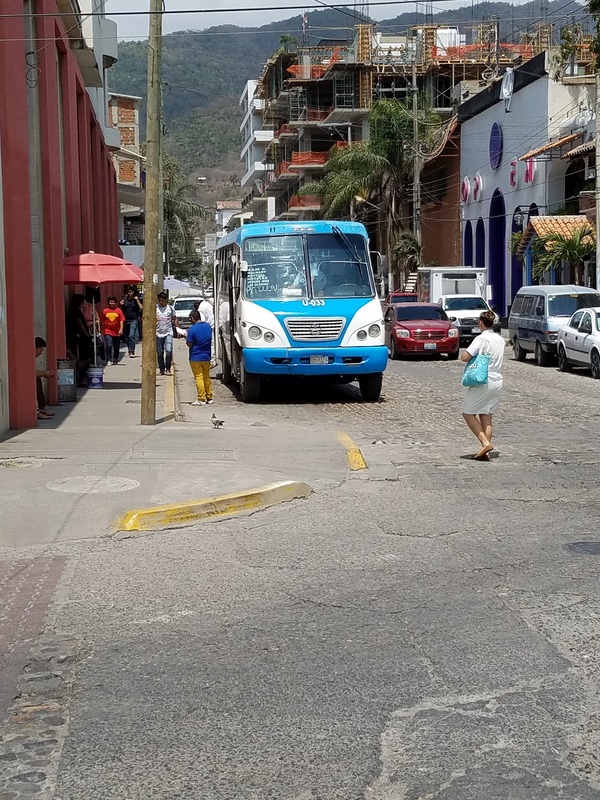 As discussed earlier, Puerto Vallarta’s economy is dominated (50% of all employment) by the tourist industry – or more specifically, by the resorts and whatever diversions are attached to them (clubs, body work, beauty care, restaurants, golf, shows, fishing excursions, snorkeling, ski-sailing, hang-gliding, jungle excursions, etc). 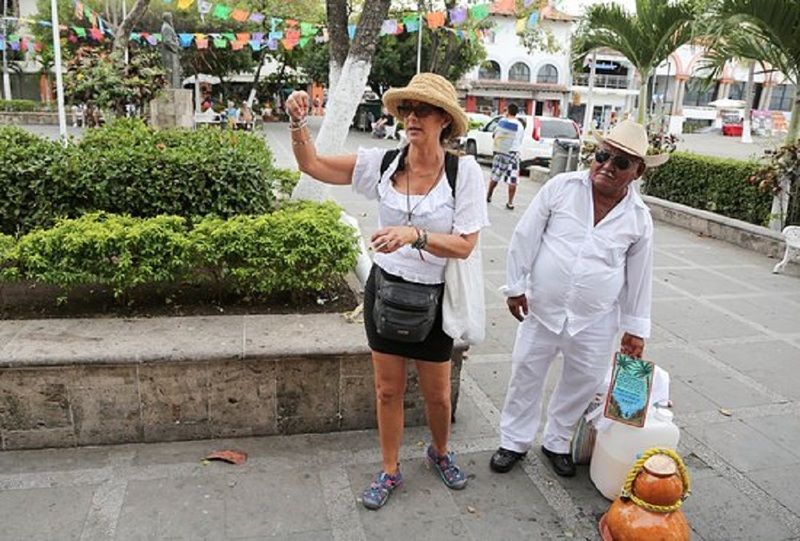 Tourists and residents (seasonal and year round), come from abroad (mostly North America), and now more and more from within Mexico. There is also agriculture (e.g. seed production, avocados trees, organic produce and various tropical fruits along the Ameca river), and small special industries (e.g. 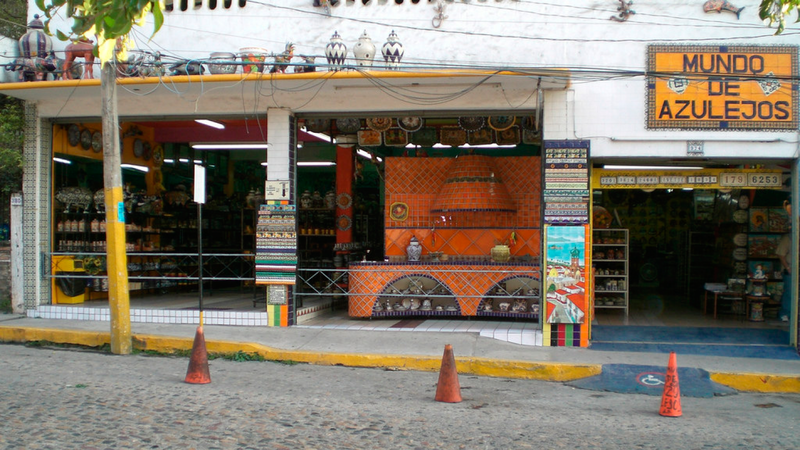 pottery and tiles), as seen in this local tile factory called Mundo de Azulejos (World of Tiles) which has produced popular decorative ceramics in Vallarta for decades. Businesses (e.g. retail clothing, restaurants, health clubs), and professions (like teachers, lawyers and doctors) serve the local population, both visitors and residents, as well as the tourist industry employees. As can be seen clearly, there is a growing real estate industry. And the notorious time-sharing condo hawkers are in every busy spot where tourists pass or congregate, from the Airport to the Centro district (Downtown). 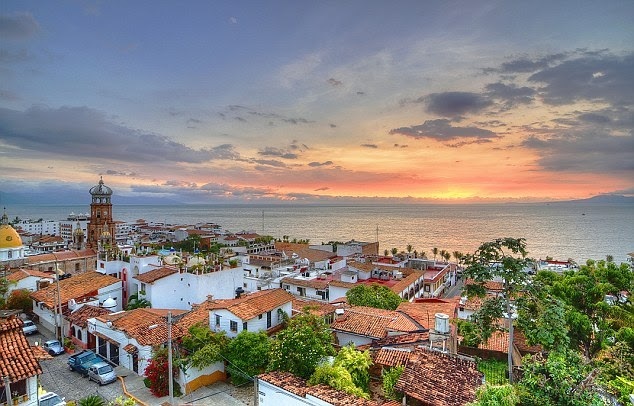 Built up land lies along the 70 mile (100 kilometer) coast line of Banderas Bay, of which Vallarta includes the 25 kilometer strip in the middle. The hills reach right to the water’s edge in some places, as the pictures show, where residences and business – like restaurants with a view – are built into the foothills. Puerto Vallarta’s international airport, situated close to the northern boundary of the city, is only a stone’s throw from the border that separates Jalisco state from its neighbor state Nayarit. It also serves the latter state’s own rapidly developing Banderas Bay beach resort zone, called Nuevo Vallarta (“New Vallarta”). There are direct flights to the two Vallartas from major east- and especially west-coast U.S. cities, as well as from mid-sized cities all across Canada, and many place in the U.K., reflecting the increased interest in Mexico as a place to vacation, but also to live. Direct flights from Chicago – the ‘Third Coast’ where I live – are available in peak season. Upon arrival, after exiting the customs inspection, I chose to ignore the crowd of very insistent taxi drivers who greet all arrivals, and dragged my suitcase to the nearest city bus stop, under the pedestrian overpass, so I could enjoy the scenery and people who use public transportation. The remarkable price differential tells a lot about the economy too: cab prices are aimed at the tourists, not the locals. They can get 500 Pesos for a cab, plus tip – i.e. about $30 – compared to 7 Pesos by bus. About 18 Pesos equal 1 Dollar, so the bus fare is equivalent to about 40 cents. The term Centro (downtown) is bit misleading. As maps show, the whole city is a string of districts, adjacent to various beach areas. On the trip to Centro, I noticed that some smaller ‘resorts’ I’d seen on previous visits were permanently closed, and sale signs were posted on their street-side buildings. It’s a safe bet that the land is getting too costly for such mid-size businesses that don’t attract droves of tourists, and can’t compete with the razzle-dazzle of large, high-rise, international hotel chains, offering all-inclusive “experiences”, located near the airport and the large marina adjacent to the airport. Having experienced these before, I much prefer the more local feeling of downtown accommodations. Most of the bus passengers wore logos of various resorts, to or from which they were evidently commuting. None of the workers I spoke to live in the areas where they are employed. They can’t afford to. When we arrived at Centro (‘Downtown’), I was struck by how many hotels and high-rise residential buildings were going up all around me, which was not the case in my visit 5 years ago. A few days later I took another public bus ride along the winding ocean side road south of the city. In some places, the jungle covered hills come down to the sea abruptly, leaving little room for development, while in other spots there are coves where boating, snorkeling and beach activities attract day-trippers. 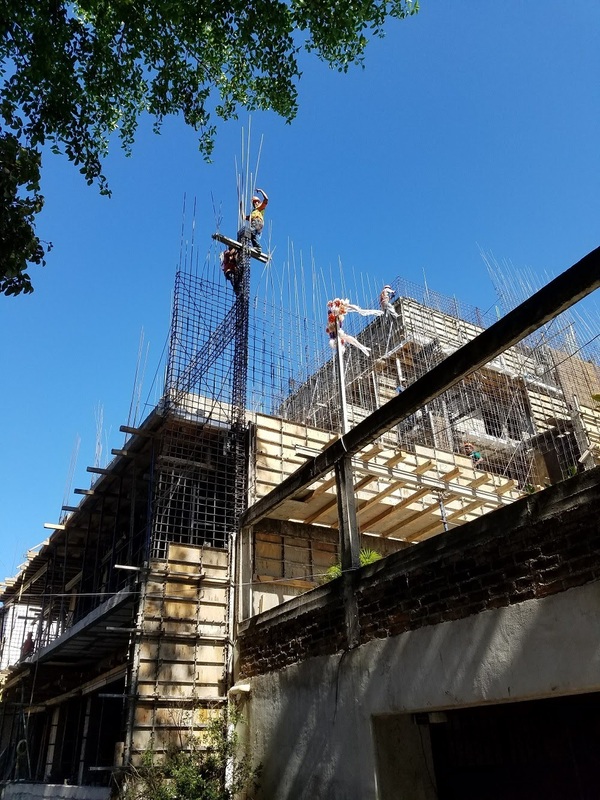 Along the route, you’ll see expensive condo complexes being built into the hillsides, while in other places, former attractions such as enormous restaurants with a vista are for sale, or have already closed. Here and there a few private mansions dot the coast, set in the hillsides, apparently oblivious to the real estate trends. 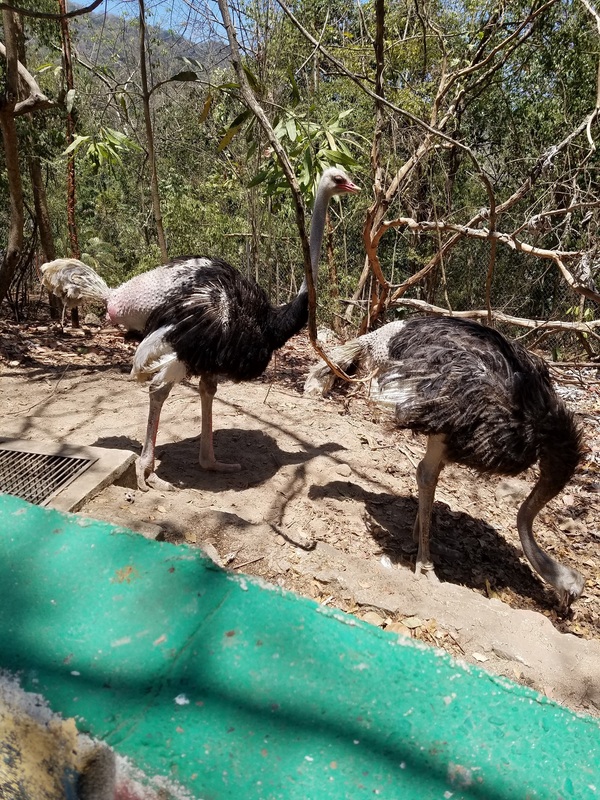 We drove about 8 miles (30 minutes) to the Puerto Vallarta “Botanical Garden” (mostly a zoo), which is neither in Puerto Vallarta, nor in in the best of condition. The first time I came here on a package tour (maybe 25 years ago) – a getaway without children, to mend (I thought) the strands of a fraying marriage. We stayed at one of a dozen concrete high-rise resorts north of the city. But we also discovered the local charm of the Centro, where ‘native’ Vallartanos live. I never went back to the high-rise resort world again. Too plastic. At its seasonal high, the city’s population is about 220,000. 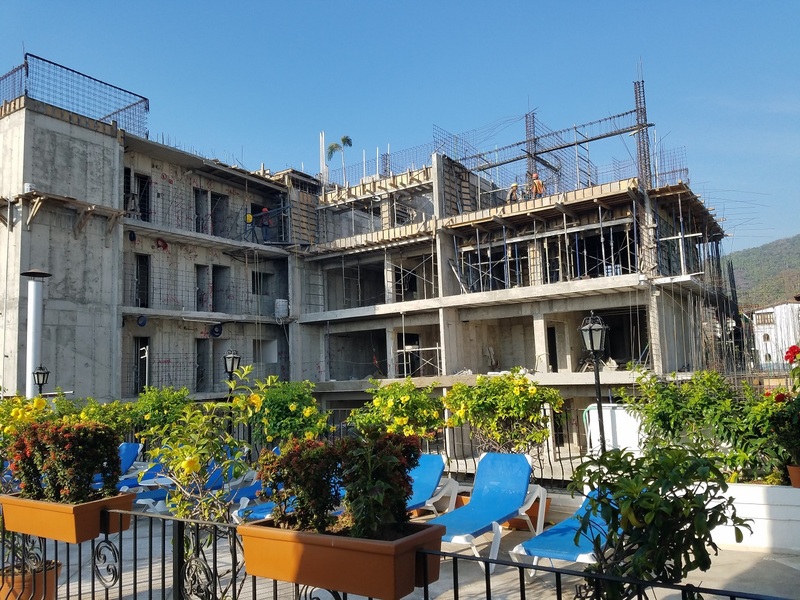 Despite the current building boom, the city’s infrastructure is starting to look a little seedy in places, compared to my last visit, even in the affluent neighborhood where my hotel is (the “Romantic Zone”). Streets and curbs need repair, sidewalks are cracking, parkways and small green spaces are brown and want attention. I’ve watched the same thing happen in Chicago’s affluent areas, despite a residential high rise boom. I hazard a guess that this is probably a function of so called austerity (conservative) policies, which in effect lower expenditures for public services, together with an increasingly thoughtless public. Governments are trying to eliminate deficits and raise taxes to do so, while at the same time, privately owned real estate and other debt-generating projects are expanding – i.e. “financialization”. There is little doubt that Mexico is suffering right now from a declining national economy, and increasing poverty levels. Compounding the problem (as well as instrumental in it), the Peso’s value against the U.S. Dollar (which is the world’s standard presently) has dropped precipitously (18 to 1). This is attractive for northerners who visit or live here, but painful for the local population. 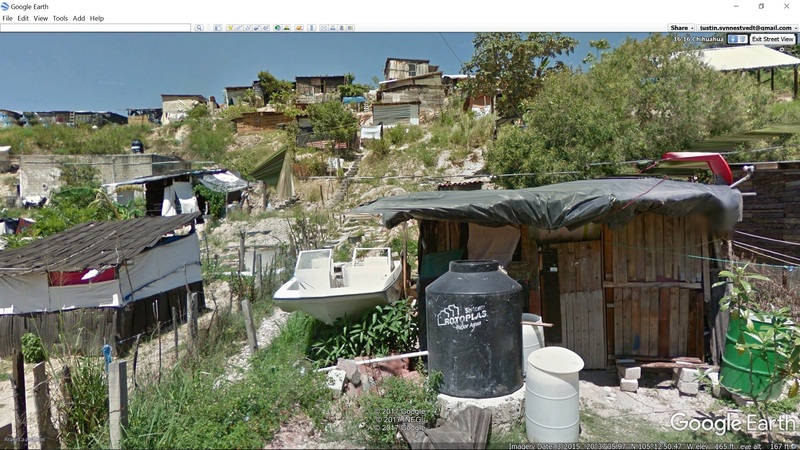 Some people who come looking for work, unless they get lucky, may live in under-served ‘colonias‘ (official districts,or barrios), such as the hillside colonia Ramblases – one of the oldest parts of the city – where many streets are still unpaved, and drinkable water and sewer connections are still unavailable to perhaps 10% of the residents. With regard to closed businesses, I imagine the issue is one of affordability of the land, as it becomes more costly to own or rent, as the town develops. Supporting this contention is the construction of 8 to 10 story residences in and around Centro, and especially in the beach-side resorts. 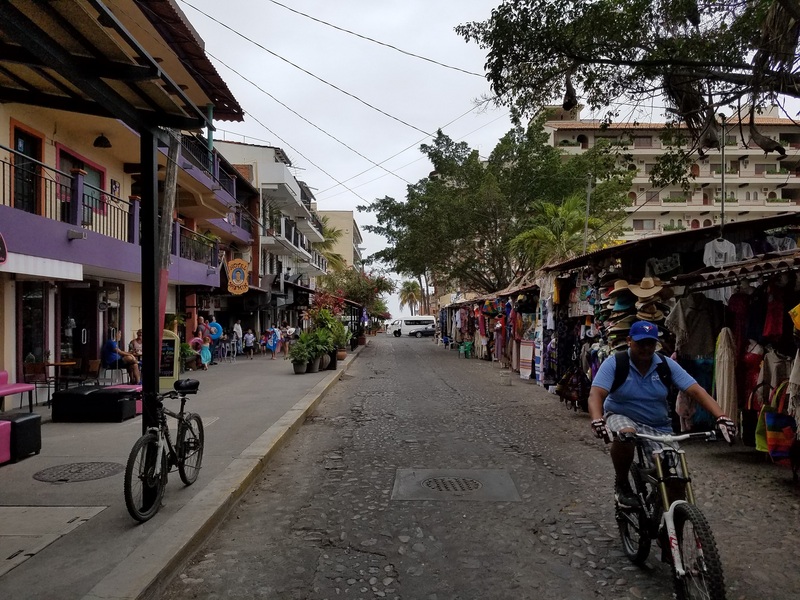 Away from the beach, and into the regular commercial district, clothing stores, health clinics, schools, restaurants, and services for everyday folk are owned by locals, rather than large corporations (domestic and foreign). 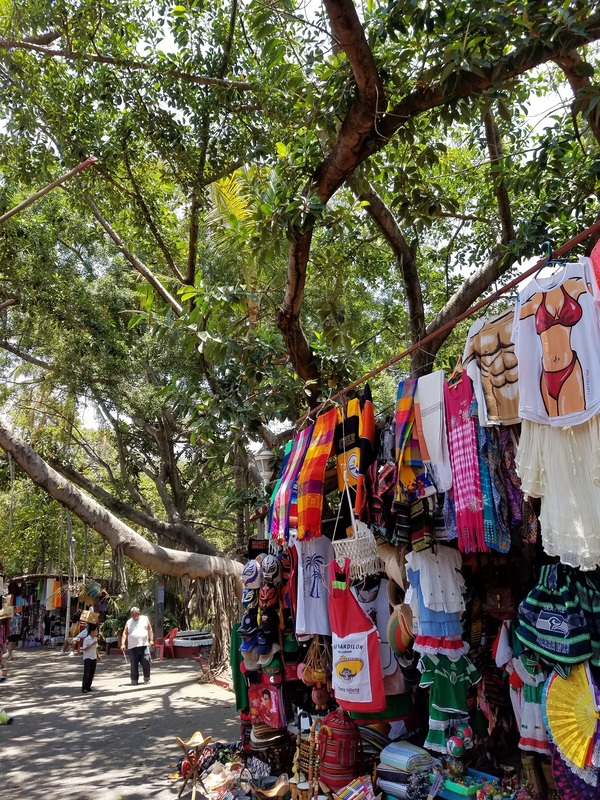 A very large, sprawling complex of flea markets along and around the Rio Cuale (not really a ‘river’, but a polluted stream), gives steep competition to the local established business owners. There are no ordinary department stores, except around the large (‘all inclusive’) resorts near the marina and the airport in the north, and these are mostly multi-national corporate chains, like Walmart and Liverpool. 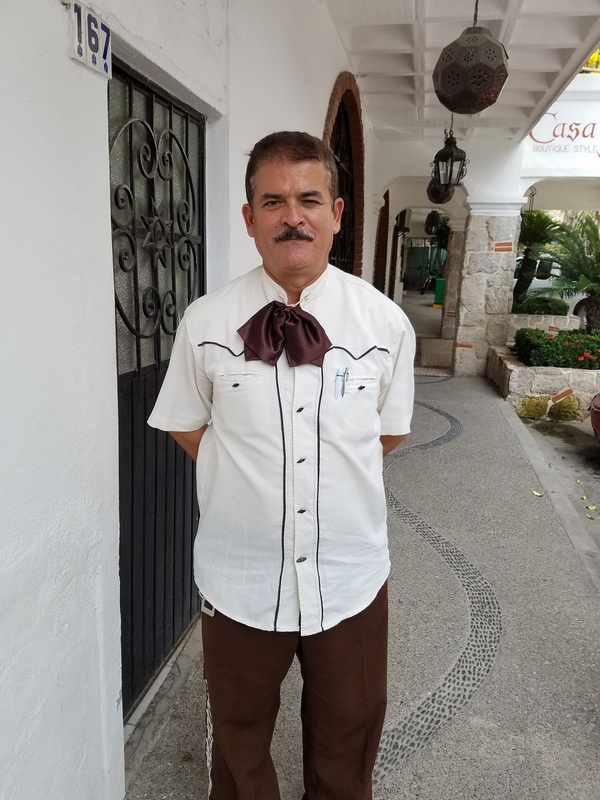 I’ve found that clothing made in Mexico, although often of comparable price, is not up to standards expected in US stores. Buttons break, zippers won’t zip, and the tailoring is messy. This was especially the case in Walmart, although it was duplicated in the only department store in Centro, namely Lans. 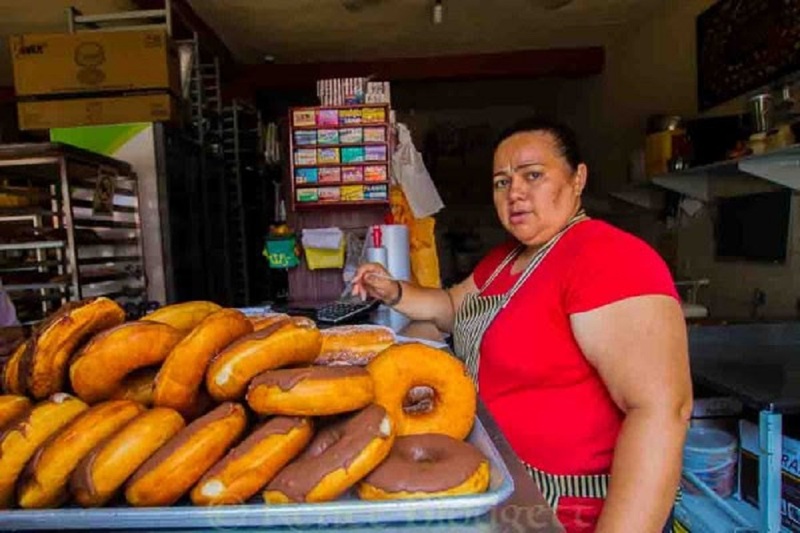 The minimum wage in Mexico (which varies regionally) is about 80 Pesos ($4.50) per day. No one can easily live on that, and few people get that low a wage. People typically work 8 to 10 hours daily, in a 6 day week. Employees I met told me they can hope for perhaps 250 Pesos/ day (e.g. in construction, receptionists or housekeepers). Store clerks get lower wages. Waiters in an upscale neighborhood may make over 500 including tips. So monthly wages (paid every two weeks) range from 5000 to 15000 Pesos for ordinary workers (roughly $250 to $850) Here is an international source for wage comparisons. It puts the numbers lower than those I heard, but the people I spoke to don’t represent the whole country. Resorts are a more lucrative area to work in. It’s possible to find a career, and develop it into a good income, even at the non-professional level. I found the seniority system at my hotel encouraged this. Employees have various roles, and can move up the ladder over time, if they show skill and dedication. Each job is marked by a uniform, and in some cases, with signs of advancement, such as insignia on their shirts, and piping, sashes and scarves that are color-coded. So if you pay attention, you can identify the receptionists, bar tenders, mid-level management, cleaning staff and of course the room maids with caps and aprons. The comedor (dining room) is especially colorful), from novitiates to captains. Julio (in cream shirt and brown trim) was hesitant to let me take his picture without his shirt tucked in. But I wanted him especially, as he has been in the hotel 34 years! 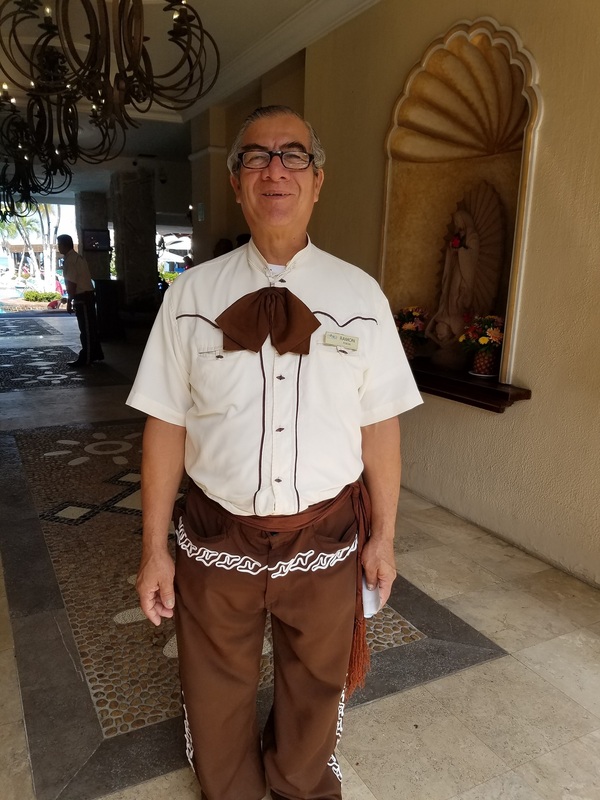 He and Ramon (27 years) work the lobby and help guests settle in. 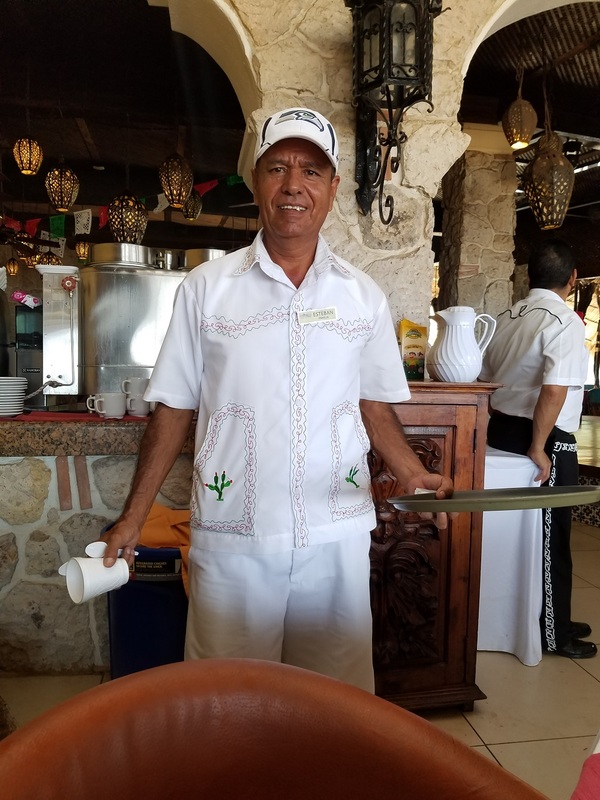 Esteban (in white) has served food and drinks at the pool and on the beach for 24 years. Alejandro (red sash) is a waiter (13 years) and Ramiro (in gray) just began in the comedor (2 months ago). Mexicans have some strong cultural traits, and environmental conditions, that may keep them from fully duplicating the more ‘developed’ exemplars in the northern hemisphere, or even intending to. There are aspects of Mexican climate, geography and social values that I think will influence the economy, in ways similar to some European countries, like Greece. I had several chat with “Willy”, owner of a highly reputed health food restaurant in the Romantic Zone, recommended by a local I stopped on the street. The food was good, with low salt options: wraps, salads, bowls, smoothies. 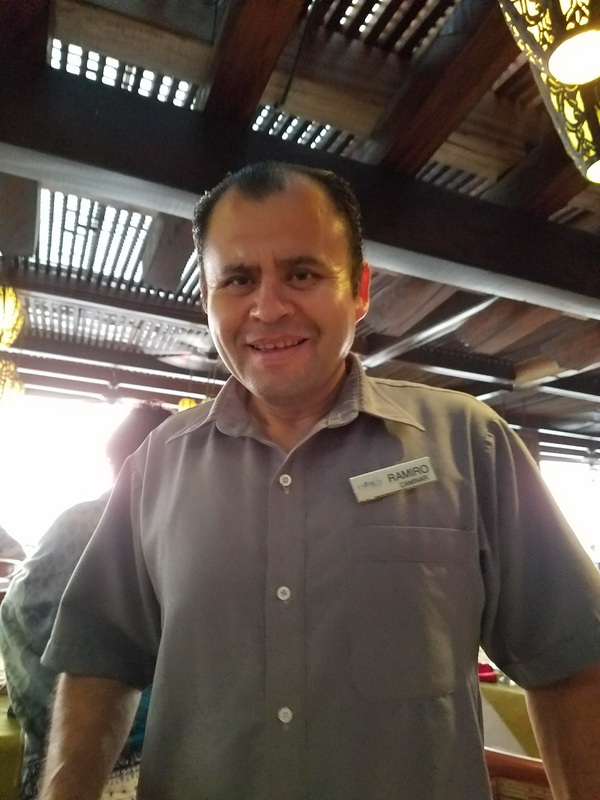 Willy – not Guillermo – is actually his given name, though people’s expectations have forced him to accept that too. Willy also spent 15 years in Seattle, doing similar real estate business, hoping to turn that eventually into the ownership of a restaurant. He only managed to work for another Seattle restauranteur, without finding his own place, but he benefited from learning the trade. 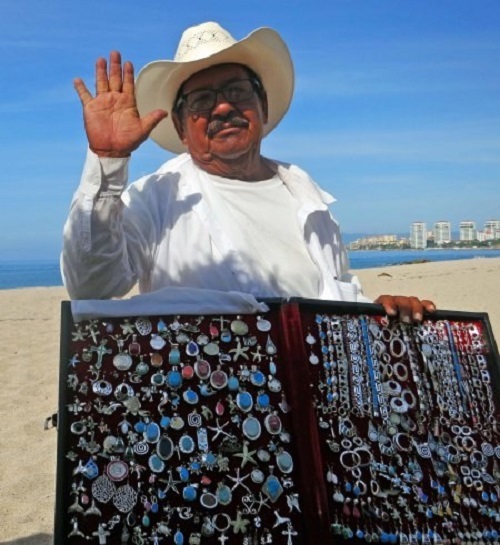 He and his partner/ companion immigrated to Vallarta to open their own shop 6 years ago. 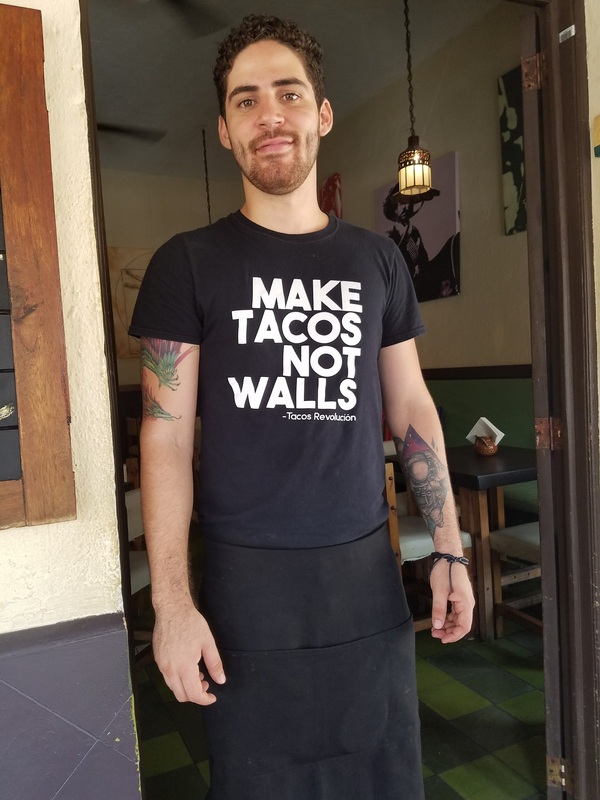 Willy thinks Mexico needs a ‘tech revolution’, especially IT, so than ‘everyone can be a business person’, instead of a patient, low wage bottom feeder. It’s an interesting perspective, in a culture whose population is using the internet, but doing little to add to its development. I find a similar personal kind of web business movement growing among young people in the US, who advertise their skills, services, art and products on social media, especially Facebook. This is part of the so-call ‘gig’ development in America. As mentioned above, it seems very likely that a warm environment has a big impact on a society’s ideas about what is worth working for, and on how people go about gaining a living. I don’t think it’s an accident, for instance, that Northern (Nordic) Europeans were the first to develop capitalism; and also started Protestantism. (The two are interrelated). They had a sense of being threatened by the harsh environment. You never could be sure what might be lurking under a bridge, or off in the mists (like the storied trolls, ogres and banshees). Individuals had to be resourceful and independent. Catholicism is a Mediterranean development, where life is more comfortable and predictable. It also emphasizes community and cooperation, not individualism and competition. The Roman and Greek supernatural beings were typically human, and understandable, compared to the fanciful beasts of northern lands. The gods of the North were subject to Doom; they were destined to die. But southern gods were “The Immortals”. Today warm places in the world are developing, including the long time under developed southern hemisphere. People are moving south. In the US, the 20th century “black migration”‘ is reversing, as conditions in the north degenerate for minority communities. They are going where a homeless person at least is not in danger of freezing. Climate and geography counts. In Mexico, food crops grow almost unbidden, small farming and land ownership is easy, and the desire to stay with the farm and pass it along in the family is great. In Greece, geography made crop farming difficult, but fishing and trade are suitable means of livelihood. Goats, bees, grapes and olives thrive, which make the durable products (cheese, honey, wine and oil) suitable for shipping and commerce. These are natural outcomes of the land. There are social habits too, and beliefs that may influence development in Mexico. One of these is that, unlike Americans, Mexicans try to survive by avoiding debt. Willy says hardly any Mexicans have mortgages. Instead, they build and develop houses themselves, as they can pay for them. Multiple generations live together, and they pass properties down in the family. The local cab driver I spoke to confirmed this. 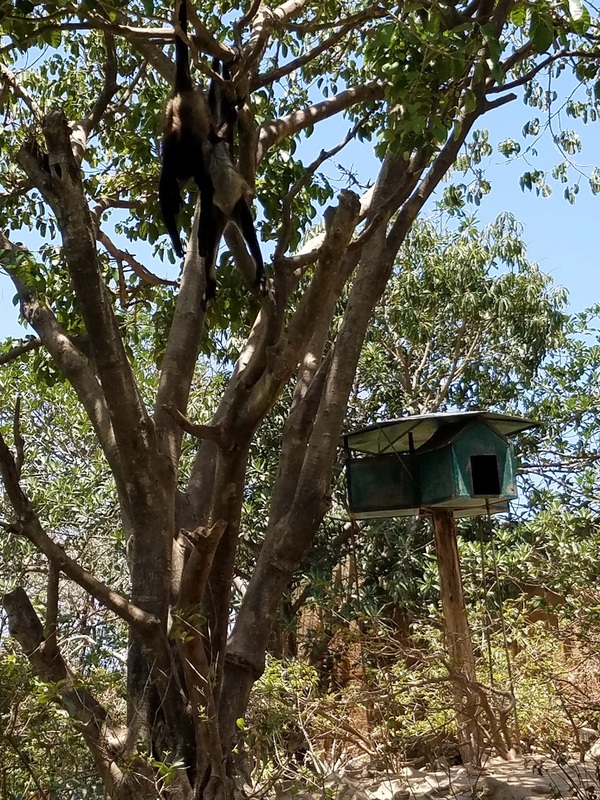 He lives with his mother, and built his own place, with no prestamo (loan). I would add that emphasis on religion, and on family ties are also very influential in Mexico (as they are in Greece). This tends to keep property in families, and to keep families together, so people find support from church community rather than from governmental programs. By contrast, Americans demand their ‘fair share’ from a sense of individual entitlement, which greatly influences the flavor of contemporary US politics. My thoughts here are musings, of course, and have no scientific certainty. But then so are many of our politician’s fiscal policy claims, against which I would gladly argue (if real debate were even possible at present). Alas, there is no serious debate in the US today, as comedian Lee Camp put it, a few days ago. Willy says his Canadian, English, Australian (and even American) acquaintances get angry when he doesn’t go along with their criticism of the US. It’s not cool to be patriotic, if that means a knee jerk reaction to defend ones country, without knowing the facts. But neither is it cool to be against the US in general. Growing up, Willy did experience lots of prejudice against Hispanics in L.A.; but he also experienced kindness, as well as great opportunities, even as a member of the immigrant population. He cites his nephew as another example, who also grew up in East L.A., but got a university degree in engineering, and has been a high level tech researcher at the Jet Propulsion Laboratory in Pasadena for years. We discussed happiness too – agreeing that it doesn’t lie in maximizing wealth. He pointed to those at the top of the financial heap who go beyond their fortune building, to develop philanthropic organizations. He wondered if that suggests money isn’t enough. But then, he added, maybe philanthropy is just an expected stage of success, possibly done for self-aggrandizement? 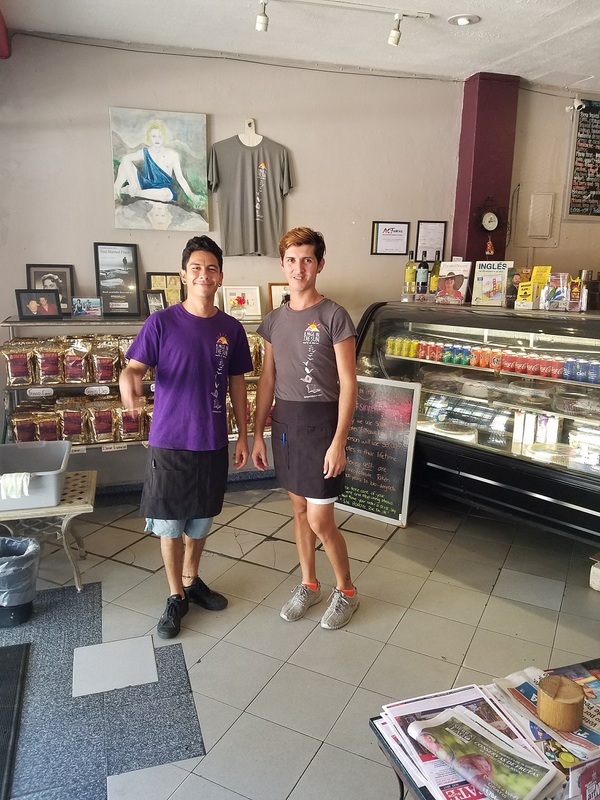 It’s clear that Willy enjoys being a good community member, cleaning up the neighborhood, offering his customers good service, and treating his employees well (including helping them pay for tuition, or meeting other needs). He also closes the restaurant, from Saturday noon til Monday morning, to provide himself and his workers time for other things. I like that. It certainly isn’t the norm. 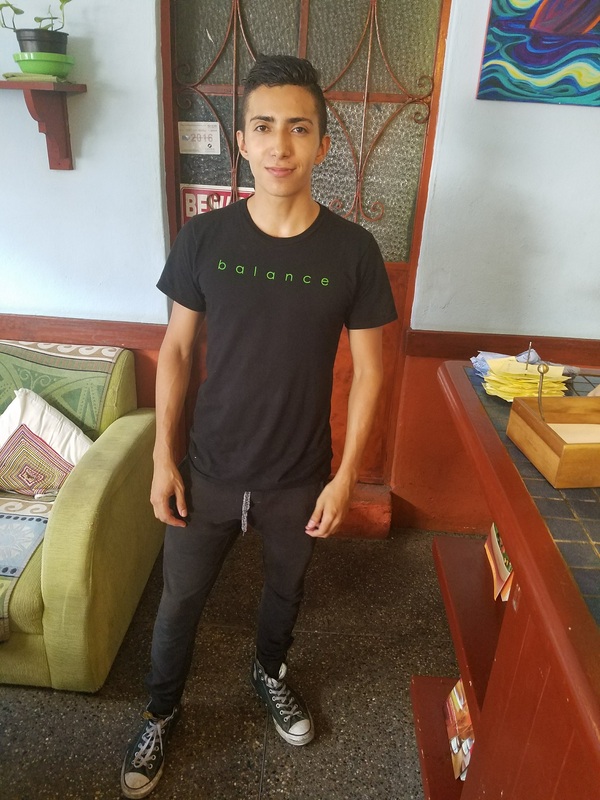 He is wearing the usual T-shirt with a slogan, but notice, instead of promoting any money-making organization, it advertises an attitude that Willy advocates: “BALANCE”. Yes! I feel fortunate to have made Willy’s acquaintance. He seems pragmatic, realistic and goodhearted. He’s an honorable example of a Mexican/ American, or American/ Mexican – or better, a human. Experience, study and critical thinking over many years lead me to believe that people are basically the same, all around the world, and throughout history (at least ‘written history’, since without that, every interpretation is just guesswork); their differences are superficial. But this opinion is not a matter that can be proven – only supported. Are Mexicans any different from Americans? I don’t think so. Is the “Mexican experience” different from the “American experience”, as pop writers like to put it? Certainly. Cultures have always differed from place to place. And in any one place, cultures change over time – sometimes radically and quickly. One such obvious, large scale and provocative cultural difference is increasingly evident today in the western world. It started with the idea of “modernity”, which in turn started with the Renaissance in Western Europe, and intensified from then til today. The aspect of modernity that interests me the most is the changing way people think of ‘humanness’, and especially what it means to be ‘an individual’, in a time when science is supplanting religious views. But that large scale topic is beyond the scope of this ‘travelog’ post. For anyone interested though, here is a summary of that view, taken from my 2016 publication, Modern Or Moral.